Which raka'at is the Dua Qunoot recited in? The Prophet (blessings and peace of Allaah be upon him) offered supplication (dua) at times of calamity on a number of occasions (in fardh salah only) , and his supplication was appropriate (or related ) to the calamity for which he was praying the Qunoot. For Qunoot e nazilah the proven sunnah from rasool (s.a.w) and his sahabas (r.a.a) is that one has to make his qunoot (dua/supplication) specific to the calamity befallen upon the Muslims or the situation and this qunoot (dua) is recited after getting up from the rukoo in the last raka of any or all fardh salah. Narrated by Abi Huraira : The Prophet used to invoke Allah in his prayer, "O Allah! Save 'Aiyash bin Abi Rabi'a and Salama bin Hisham and Al-Walid bin Al-Walid; O Allah! Save the weak among the believers; O Allah! Be hard upon the tribe of Mudar and inflict years (of famine) upon them like the (famine) years of Joseph." It was narrated that Ibn ‘Abbaas (may Allaah be pleased with him) said: The Messenger of Allaah (blessings and peace of Allaah be upon him) prayed Qunoot for a month in Zuhr, ‘Asr, Maghrib, ‘Isha’ and Fajr prayer, when he said: Sami’a Allaahu liman hamidah in the last rak’ah (i.e after getting up from rukoo in the last rakah), praying against some tribes of Banu Sulaym, and against Ri’l, Dhakwaan and ‘Usayyah, and those who were behind him said Ameen. The Prophet (sallallaahu 'alayhe wa sallam) used to raise his hands in his qunoot an-naazilah, supplicating against people. [Ref: Saheeh: Ahmad 3/137, al-Mu'jam as-Sagheer, and al-Bayhaqee in Dalaa'il an-Nubuwwah and as-Sunan al-Kubraa. See also: Irwaa' al-Ghaleel (2/181)]. Qunoot e witr is the dua which is said during the regular Isha'a witr prayer. it is also a supplication which one makes during the last rakat of the witr prayer. the Dua to be said in Qunoot e witr is not the same as Qunoot e nazilah because this is a general dua and not a dua made specifically for a calamity and its likes. Should we directly start reciting the dua e Qunoot ? Because it was narrated that some of the Sahaabah (may Allaah be pleased with them) – including Ubayy ibn Ka’b and Mu’aadh al-Ansaary (may Allaah be pleased with them) – did that at the end of Qunoot al-Witr. The Dua Qunoot should be said before rukoo or after rukoo? There is a valid difference of opinion amongst scholars regarding this topic. However to summarize, most of the scholars say one can make the dua either before the rukoo or after the rukoo and both are permissible. "Whatever is established for the naazilah qunoot (performed in the obligatory prayers) is also acceptable for the qunoot of witr prayer. This is supported by the principle that whatever is allowed in an obligatory act is also allowed in an optional act, unless there exists specific evidence to prohibit it. " The second option and the better or safer option is that Qunoot e witr should be recited before the rukoo only. This is because there is no specific sahih/hasan hadith which indicates that rasool (s.a.w) or the sahabas (r.a.a) (during their normal Isha'a witr prayer) recited the qunoot after rukoo. Rather what is proven from the sahabas (r.a.a) is that thr isha'a witr qunoot is recited before the rukoo itself. Narrated by 'Asim Ahwal : I asked Anas bin Malik about the qunut. Anas replied, "Definitely it was (recited)". I asked, "Before bowing or after it?" Anas replied, "Before bowing." I added, "So and so has told me that you had informed him that it had been after bowing." Anas said, "He told an untruth (i.e. "was mistaken," according to the Hijazi dialect). Allah's Apostle recited qunut after bowing (i.e qunoot e nazilah) for a period of one month." Anas added, "The Prophet sent about seventy men (who knew the Quran by heart) towards the pagans (of Najd) who were less than they in number and there was a peace treaty between them and Allah's Apostles (but the Pagans broke the treaty and killed the seventy men). So Allah's Apostle recited qunut for a period of one month asking Allah to punish them." 1. Firstly this narration does not specify which kind of Qunoot i.e Qunoot e nazilah or qunoot e witr. 2. Secondly this narration is weak due to the Narrator Ja’afar Ibn Maimoon who is considered to be weak according to the majority of the scholars of Hadeeth. (II) There is a narration from Hasan RadhiAllaahu Anhu in Mustadrak al-Haakim (3/172) and Imaam Baihaqees Sunan al-Kubraa (3/38-39) which establishes the Qunoot after the rukoo however this is weak according to some scholars of hadeeth whereas others like the late Albanian Hadeeth Master Muhammad Naasir ud deen authenticated it and graded it Hasan. This may be understood due to the text of the aforementioned hadeeth as the hadeeth has been narrated via other chains and hence him grading it Hasan. 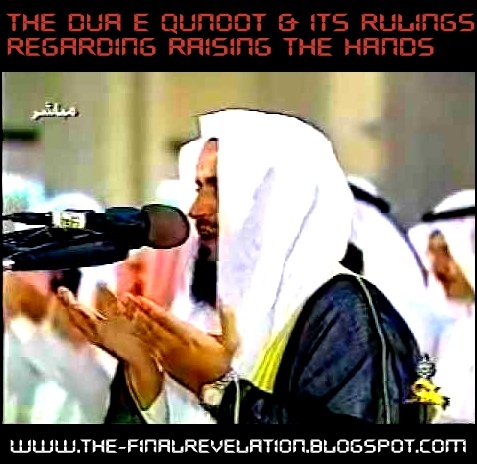 Should hands be raised during dua (qunoot e witr) ? Raising the hands here implies that the palm is pointed or kept towards the sky for making dua. This is again a topic upon which scholars have differed. some say it is mustahab (recommended), some say it is allowed and some say it is better not to do so. 2. Narrations from prophet (s.a.w) and sahabas like Umar (r.a), Ibn abbas (r.a) and etc which state that they raised their hands during Qunoot e Nazilah. The scholars (to support raising the hands in Isha'a witr) imply the principle that "whatever is allowed in an obligatory act , it is also allowed in an optional (sunnah or nafil) act unless there is evidence prohibiting it"
The above hadith (no. 4) of Abdullah ibn Masud (r.a) is Da'eef (weak). Its Isnad is Da’eef because of Layth bin Abi Saleem. According to the jumhoor of Muhadditheen, he is weak. He also got a weak memorizer at the end of his age, and he is also accused of Tadlees. Ibn Taymiyyah (Rahimahullaah) said in Majmoo’ al- Fataawa (23/100): “The Fuqaha’ (jurists) of Hadeeth like Ahmad and others see the permissibility of both matters, (i.e. making the Qunoot before and after the Rukoo’) and that regarding this issue. However, they chose the Qunoot after the Rukoo’ because it is mentioned more and it is more suitable after saying “Sami’a Allaah liman Hamidah” (Allaah hears and responds to whoever praises Him), so he starts praising Allaah before invoking Him. Shaikh al-Albaani (Rahimahullaah) said in Irwaa’ al-Ghaleel (2/171), after mentioning all the authenticated narrations for the Qunoot before and after the Rukoo’: “The correct point of view is the affirmation of the two matters. Al-Hasan bin Ali (r.a) who said: I committed to memory from the Messenger of Allah, sallallahu alayhi wasallam, (the following words): "Leave that about which you are in doubt for that about which you are in no doubt." Abu Haatim ar-Raazee (d.277H) said, “Abu Zur’ah ar-Raazee (d.264H) asked me, “Do you raise your hands for Qunoot (of witr)? I replied, “No” and then I asked him do you raise your hands and he replied yes. So I asked him what is your evidence? Abu Haatim said: the hadeeth of Anas that verily the Messenger of Allaah (Sallalahu Alayhee Wasallam) would never raise his hands for any dua except in the rain prayer , and then he (Abu Zur’ah) remained silent. Please note that the hadith of anas (r.a) is not the only hadith which shows that prophet (s.a.w) raised his hands to make dua. prophet (s.a.w) raised his hands at several places. Maybe anas (r.a) didn't witness it. Therefore the safer option or the option which is closest to sunnah in the `Isha witr is to not raise our hands during qunoot e witr, rather supplicate with our hands placed normally as we place them during salah (on our chest) because there is no clear authentic hadeeth that shows that rasool (s.a.w) ever raised his hands during qunoot e witer but if someone wishes to do so based on analogical reasons (using the ahadeeth of qunoot e nazilah) then he may do so but it would not be classified as a sunnah of the nabi (s.a.w) for `Isha witr. Should we say the Dua e Qunoot e Witr always in every witr? There is nothing wrong with that. The du’aa’ of Qunoot is Sunnah and the Prophet (blessings and peace of Allah be upon him) used to recite Qunoot. He taught Qunoot and the words of Qunoot in Witr to al-Hasan, so it is Sunnah. 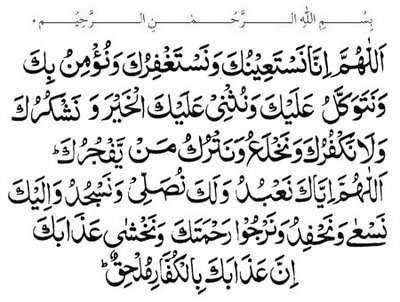 If you recite it every night, there is nothing wrong with that, and if you omit it on some occasions so that the people will know that it is not obligatory, there is nothing wrong with that either. If the imam omits Qunoot on some occasions so that the people will know that is not obligatory, there is nothing wrong with that. When the Prophet (blessings and peace of Allah be upon him) taught al-Hasan Qunoot, he did not tell him to omit it on some days. This indicates that if he does it persistently, there is nothing wrong with that. All good is from Allah and all the mistakes are mine. May Allah have mercy on the one who corrects me. Salam, good description! but please check & correct one reference, its Abudaood Hadith 1420, not 1213, for witr invocations. that was really an useful information.it really helped me a lot!!!!! JazakAllah! I have memorized the dua alhamdulillah and will be reciting it in my witr pray inshAllah. jazakAllahkhaira,May Allahazujal give us the tawfeeq to do both the qunoots as we are in time of calamities. You admonish me for giving my opinion on a hadeeth (which isn't mine but of scholars) and then yourself go ahead to put forward your opinion " what im understood is: this hadith.."
Jazakallah for the info. There is one thing though that I seem to be confused about. Which is correct : at Fajr as necessary in the Masjid I attend, Qunoot e Nazilah is recited, and Qunoot e- Witr is usually at Witr. However the two seem to have been swopped around on this site with regards to their Arabic Recitation. Is this correct ?. I am speaking from a perspective of being thought in a Hanafi environment, hence I see the difference.I am sure it would not make a difference as its a Sunnah, good but not stressed and if one does not recite it, its Ok, or one could recite any supplication if one does not know the Arabic equivalent. Waiyyak. the regular/continuous recitation or qunoot e nazilah in every fajr prayer is what the shawafi seem to do as far as i know and this is the madhab of the shawafi. With regards to interchanging the du`as then there is no harm as you understood yourself. it is all acceptable and fine. wallahu `alam. I think it would be preferred if you edit your blog and swap the two dua titles around, as some may learn a different dua from their fiqh group. Sorry to be so harsh, if it comes out that way. It's just that I would also like this page to be as beneficial as possible. 1). To not delay the rakat of a fard prayer. Brother Omair, please refrain from passing and deducing own analysis and perspective. This is not an MBA project in one of your college's . This is the deen of allah. Any and everything you say will be held accountable against you in this case . The interpretation of ahadeeth is something which the inheritors of the prophet (the scholars) are entitled to. We should not throw in our own personal logic based interpretations in the divinely inspired actions of the prophet, especially when we lack islamic scholarship and credibility. For 100 warnings from the salafus saliheen warning against self interpretation see : http://the-finalrevelation.blogspot.com/2014/02/warning-from-self-interpretation-of.html. the prophet said deen is naseehah (since advise) so i advise you sincerely the above. JazakAllah Khair for the sharing. is there an audio for the qunut e Witr? Jajak Allah Khar for sharing this..
May Allah Blase you and also me. considering the present situation of muslims in syria, palestine and many other places , is it permissible to recite qunoot e nazilla in every daily prayers ? As per the view of one group of scholars; Yes we can. Jaza Ka Allah Kheir, it was indeed very helpful and insightful, May Allah Reward your efforts. Will there be any problem if a hanafi prays witr differently!? Brother shayan, please read the article fully to *realize* the answer to your own question. If in case you already have read *fully* and yet don't know the answer then the reply is : " It is not a question of problem, but rather sincerity. Sincerity to Allah, his messenger and prophet's sunnah and commands demands that a muslim undertakes any or every action that is the most authentic or closes to being right " Praying witr the strongest way as described above will not be sinful, rather it will be rewarding if you adopt it for the sake of Allah. Excellent outstanding article, hope you keep up this good work on many other pertinent topics for the guidance of this disoriented umma. waiyyak saba. You have to say the regular stuff which we say after getting up from rukoo which is samiallah huliman hamida - rabbana walakal hamd. Hi, I read through the dua-e-qunoot transliteration it seems the there is a word missed in it. If I am wrong correct me, but that's how I was taught it. a lot to take in for someone who wants to get on with his life and worship Allah as correctly as possible. From so much confusion going back and forth between he said/she said, i have gathered the following should be permissible, please tell me if it's sufficient. I intend to pray 3 witr back to back. Therefor i will have only one sitting. Also, i will recite the general dua e qunoot which is famous among the Hanafis. In the 3rd rakat i will recite Surah Fathia and then surah Qafiroon. Before going into rukoo, i will begin my general dua e qunoot.